Both Joe Cormier and his nephew J.P. Cormier are wonderful musicians. 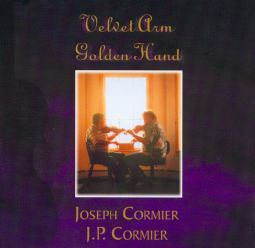 Velvet Arm, Golden Hand is an album of classic Cape Breton repertoire played as solos and duets. The jigs were first recorded together on a Winston Fitzgerald 78. The Chorus is found in both the Skye and Fitzgerald books. In Irish circles it is known as The Kilfenora. Originally from 18th century Scotland, The Sailor's Wife is found in Jerry Holland's Collection of Fiddle Tunes. All favorite 'Winston tunes". The last is found in Dan R's Trip to Windsor Collection. The first two are reputedly Angus Chisholm compositions , though the 2nd has never been confirmed as one of his originals. All favorites of Winston Fitzgerald, the first two are often associated with the playing of Hector MacAndrew.